For those of us who follow this the sport of Kings, the countdown to opening weekend is well and truly underway. Four weeks fellow hunters, four bloody weeks. 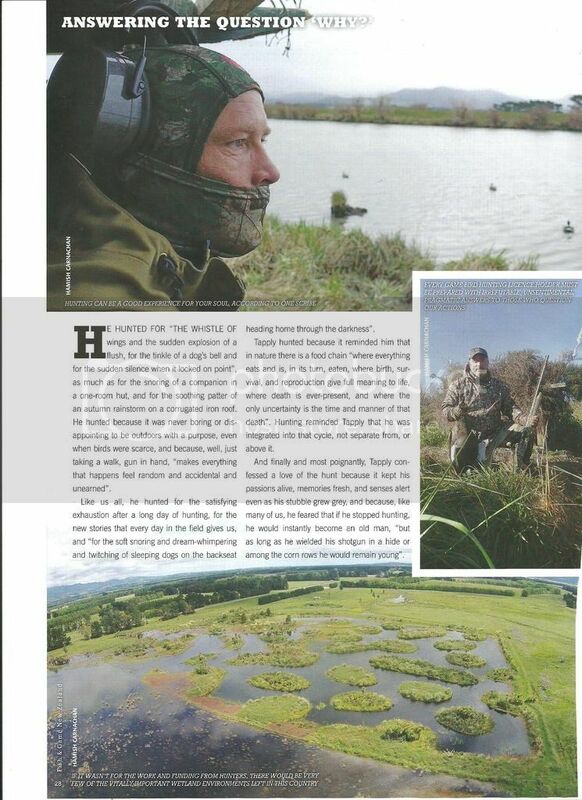 Some thoughts here from the Fish&Game magazine. Much of it is aimed at those who hunt with dogs. Quote from the next page.. It would be remiss of me not to at least touch on how dogs play such an integral part to our 'why we game bird hunt' rational. Mans hunting interaction with dogs is an undeniable as it is traditional. Today, many wing shooters only hunt to enjoy their dogs. Says American writer and bird dog expert C.E. Metz: "Those who have never been owned by a sporting dog have missed one of life's greatest pleasures". Amen to that. I really feel for the people of Edgecumbe and hope they get thru this. So no disrespect to them or their plight. I hope my Maimai is ok, after spending some considerable time and dollars on revamping it. I shoot at the mouth of the Rangitaiki in the Thornton lagoon and now can't get in as the gate has been locked. Might have to go for a paddle on the SUP and check it out this weekend. With all this water around in the paddocks, the ducks have a huge area now in which to feed and sleep, so shooting is going to be hit and miss literally this coming opening. Was down in Reproroa yesterday and there is now a huge lake just before you get to the village. So I guess the shooters there will have to work for their birds as well. The water at Rawhiti was going over the road, so I guess there will be Maimai damage there as well. I hope it doesn't effect your shooting too badly. I would love to see some photos when you go in to have a look at your Maimai.